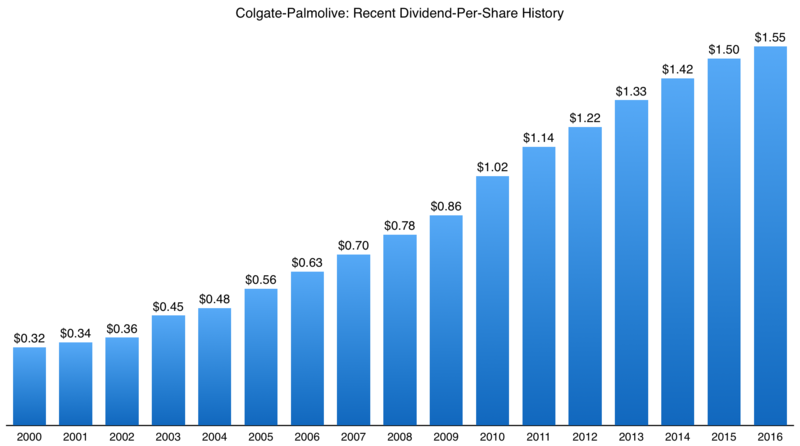 The first piece I wrote about Colgate-Palmolive stock briefly covered the groundwork of why you’d want its shares populating a long-term income portfolio. The short version is that the company generates insanely high quality profits that are inherently defensive; the extent of which has allowed Colgate (NYSE: CL) to establish a dividend record stretching back all the way to 1895 (including consecutive annual dividend increases going back to the early 1960s). It’s a perennial wealth creating machine that has compounded at a rate of around 14.5% per annum since the late 1950s. Even a timeframe incorporating the 26 years that I’ve been alive has seen every $10,000 invested into Colgate stock now churning out $4,600 in annual dividend income. The one thing that short piece didn’t really cover was the current valuation; and admittedly when you pull up the fundamentals they probably don’t immediately strike you as supporting an investment case at the current share price of around $66.40. Back in 2010 Colgate was pulling in net profits of $2.2 billion on annual revenues of $15.6 billion. This year net income is forecast to come in at around $2.5 billion on revenues of approximately $15.4 billion. Basically we’ve seen flat revenue growth over the past six years with a slight boost to net income as the company have managed to expand their profit margins. On a per-share basis the situation looks slightly better as Colgate have managed to decrease the share count by around 10% during that time. Still, assuming forecast earnings-per-share of $2.80 prove to be the case then the current share price of $66.40 values the stock at 23.7x annual earnings. Given that the normalised earnings-per-share growth rate is just 2.6% per annum over the past six years that might not appear to be particularly appealing at this moment in time. Sure enough you will find a bunch of comments on financial media sites turning negative on the shares and the business. Personally I find that kind of short-term syndrome misplaced when it hits premier dividend stocks like Colgate-Palmolive because there are so many reasons it deserves a pass when it comes up against periods of low growth; doubly so when the underlying reasons have nothing to do with the actual business but are macroeconomic factors that are outside of the control of the Board in New York. Now the reason that Colgate’s reported numbers have struggled won’t be a surprise to those who own shares or follow the stock: the strength of the US dollar has been a major issue. When you have a company that does around 80% of its business outside of the United States – even when it is as exceptional as Colgate-Palmolive undoubtedly is – then it’s going to throw up some problems. Just to get a feel for how strong the currency movements against the company have been then consider that over fiscal year 2015 the headline figure for revenue was a decrease of 7% compared to 2014. If you were looking at that on a stock screener or some other kind of financial portal without putting it into context you’d probably conclude there was some underlying issue with the business. Maybe Colgate was rapidly losing market share to its rivals, or folks around the world had suddenly stopped buying toothpaste and toothbrushes. Perhaps a new technology was in the early stages of revolutionising oral hygiene. In reality none of those things are happening, and once you exclude currency movements you’d have actually been looking at organic sales growth of 5%. Now it kind of goes without saying that the difference between a 7% decrease and a 5% increase is pretty big over just one year, but which figure do you suppose long-term shareholders are more interested in? Most likely it’s the one that shows the company is in fact continuing to sell more toothpaste, toothbrushes and personal care products in their various markets every year (whilst also raising prices like clockwork). If we bring it forward to the current financial year then you’ll notice the same pattern. Over the first nine months the headline figures show that total company sales are down 5.5% on the equivalent nine month period last year. Again that’s largely down to currency movements and the fact the company no longer include their Venezuelan operations in results figures. On a currency neutral basis organic sales are actually up 4.5%. The currency and Venezuela issue proved to be such a headwind that in emerging markets – that’s Latin America, Asia (excluding Japan), Africa/Eurasia and Central Europe – they turned 7% organic sales growth into a 10% drop in reported sales. Besides the obvious effect that’s having on the accounting figures the currency fluctuations also have the effect of making the shares seem more expensive than they actually are. In other words the 23.7x earnings figure that will show up on stock screeners isn’t a true reflection of what’s occurring on the ground. Given that over the last couple of decades the average P/E ratio of Colgate stock has averaged approximately 20x annual earnings you could reasonably argue it’s fairly valued for those looking to add quality names to a long term dividend portfolio. Over the same time frame the firm have generated earnings per share growth of 8% and dividend per share growth of 10.4%. Assuming that the underlying earnings power of the firm remains intact you might reasonably conclude that the company will be able to grow those dividends by around 8% per annum going forward. That assumption incorporates everything from ignoring the effects of short-term currency movements on accounting figures to including the long-term effects of share buybacks. I deliberately include the last point as it’s the underlying compounding machine that has enabled Colgate to eliminate 20% of the float since 2000 whilst still ensuring significant cash to spend on marketing and maintaining their massive brand equity. For every $10,000 investment made at the current share price that would translate into around $1,100 worth of annual income twenty years down the line. Furthermore it doesn’t take into account the roughly $70 per share in cash dividends that would be paid out along the way (using the 8% growth assumption above). That’s cash that can be instantly reinvested into more Colgate-Palmolive stock or diversified into other higher quality names as and when they become attractive. Either way the upshot is more compounding and more income down the line.